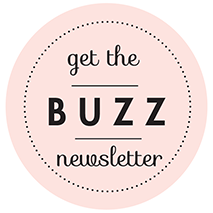 Guest Post: Invitation Expertise from Katie Hackedorn of Katie & Co.
Planning a spring wedding? It’s just about time to start spreading the word. 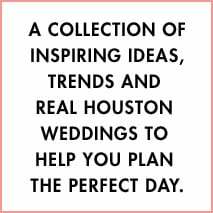 To help guide you through the etiquette, scheduling and infinite style possibilities for your save-the-dates, wedding invitations and other wedding correspondence, we’ve invited renowned Houston invitation designer Katie Hackedorn of Katie & Co. to share her expert advice! Save-the-Date or Not? 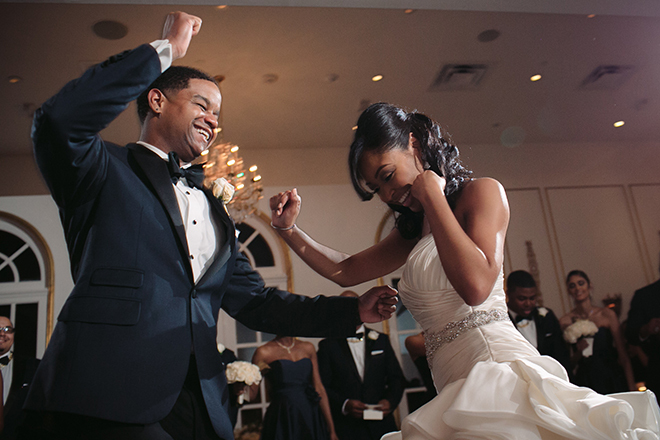 Not all weddings require a save-the-date, however more brides are sending them now than ever. That’s because there are now so many creative options for printing, including the advent of digital photography—which makes it possible to use that perfectly adorable pic or from your engagement shoot or other romantic photo on your save-the-date. 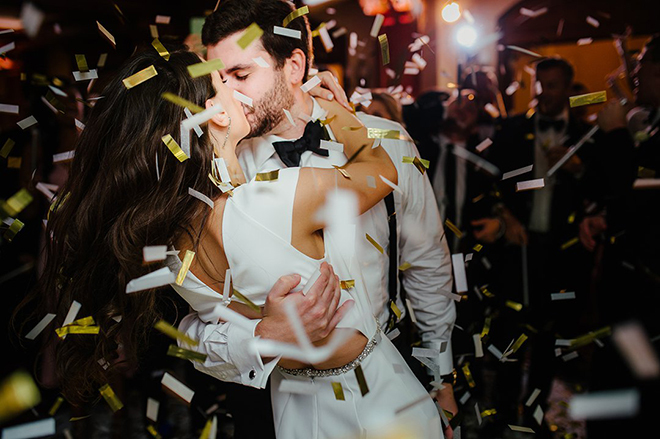 So even if you’re not planning a destination wedding, or a wedding on a holiday weekend or during a time of year when people may be traveling—traditionally the types of weddings for which save-the-dates were must-sends—you can set the tone and build excitement for your big day when it’s still about six months away. Dinners & Brunches. Rehearsal dinner and brunch invitations should be sent separately from wedding invitations, as these events are not always hosted by the same people who are hosting the wedding. Often the rehearsal dinner is hosted by the groom’s parents, so the invitation should reflect that. It may have a more masculine feel than the wedding invitation and it may be much less formal. Invitation design is also influenced by the location of the dinner. Same thing goes for the brunch, which is generally a less formal affair and somewhat lighthearted and casual, plus it occurs at a totally different time of day, which affects the look of the invitation. Looking for creative rehearsal dinner invitation ideas? 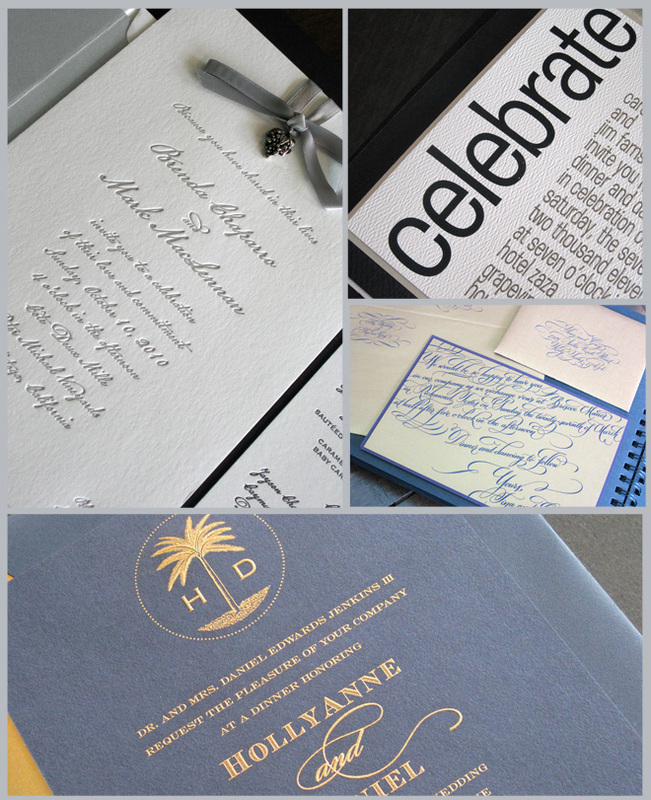 We once did a beautifully engraved dinner invitation with the groom’s family crest embossed at the top. This signified the importance of family and was a lovely complement to the bride’s family’s wedding invitation. I know that some people feel that separate mailings are wasteful, but really, your wedding invitation deserves to stand on its own and be special, and not overstuffed with other items. Wedding Invitation Schedule & Etiquette. Wedding invitations should be mailed six to eight weeks before the wedding. The mailing should include the invitation, possibly a reception card and a response set. You can also include a directions or accommodations insert. 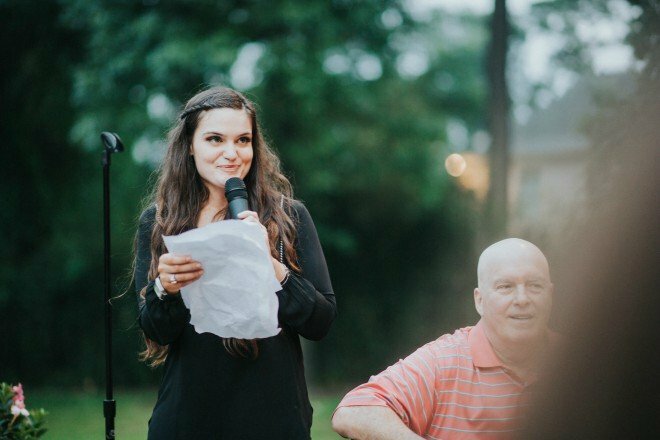 I prefer simple straightforward wording, but every bride is different, and often there are circumstances that need to be reflected in the wording. The most reasonable way to indicate whom the invitation is meant for is to address the envelopes accordingly. Not writing “and family” or the children’s names SHOULD be enough. However, there are always those who don’t take note of whom the invitation was actually addressed to and decide to bring whomever they want. You should take note of and address these situations as soon you receive a response card that may have additional names written on it. 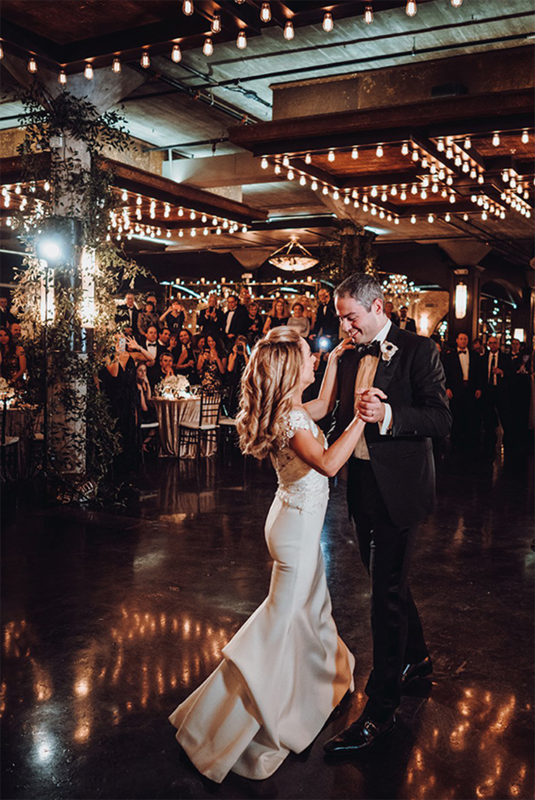 A polite phone call by the wedding planner or a friend of the bride, saying, “While we would love to have your entire family, we are just unable to accommodate more than…” followed by names of the exact people the invitation was addressed to, should suffice. I don’t think most people realize the cost each uninvited guest adds to the budget until they have been on the planning end of their own event. And remember, registry information is something that should NOT be included on or sent with the invitation; instead it may be communicated, by parents of the bride and groom or members of the wedding party, to those guests who call or email to inquire about it. Looking to tap further into Katie’s invitation expertise? Love the look of Katie’s stunning work, pictured right here in this lil’ ol’ blog post? Call her at 713.802.1345 or visit Katie & Co. online! 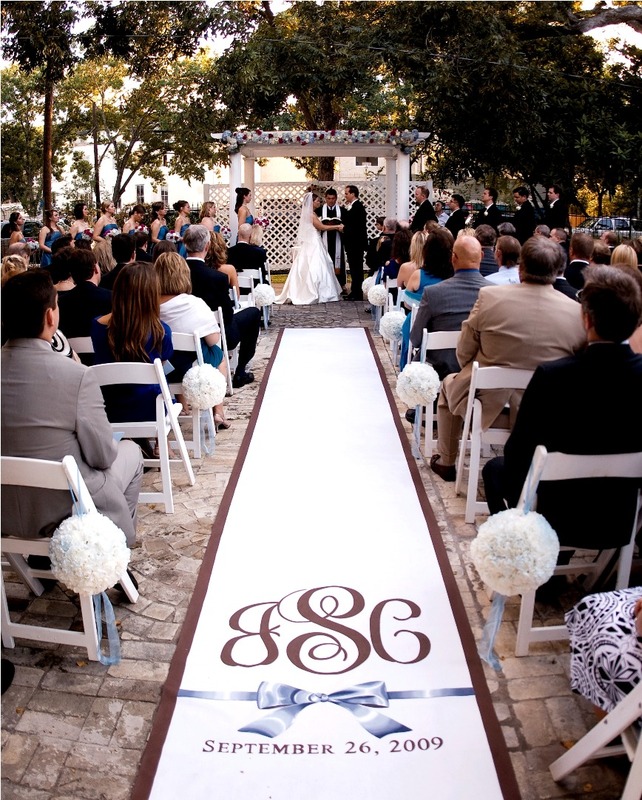 No matter where you plan to say, “I do,” an aisle runner makes the ceremony site look complete. 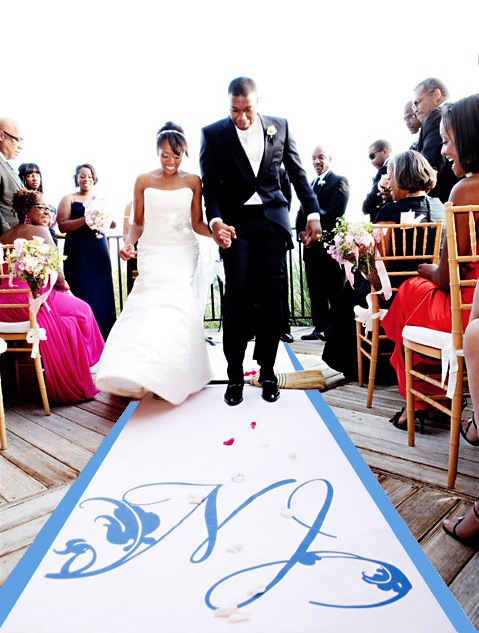 Traditionally, ceremony ushers roll out the runner (which is secured near the altar) from altar to aisle entrance to signal the start of the processional. And if you’re a traditional bride getting married in a traditional church ceremony, this may be the path you choose. But don’t think you need to stick to conventional customs when it comes to runners. With so many brides tying the knot in unconventional settings—in hotel lobbies, on lawns, in museums, on rooftops, etc.—practicality often trumps tradition in the area of runner setup. 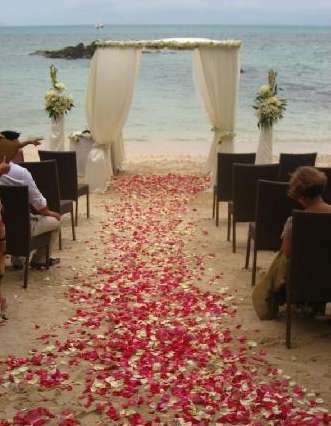 For outdoor ceremonies, especially those on grass or sand, you might choose to create a “runner” out of rose petals, or paper or fabric confetti—any scattered material, really, that allows you to walk safely and comfortably without snagging a heel and risking a ripped runner, or worse, a stumble or fall. 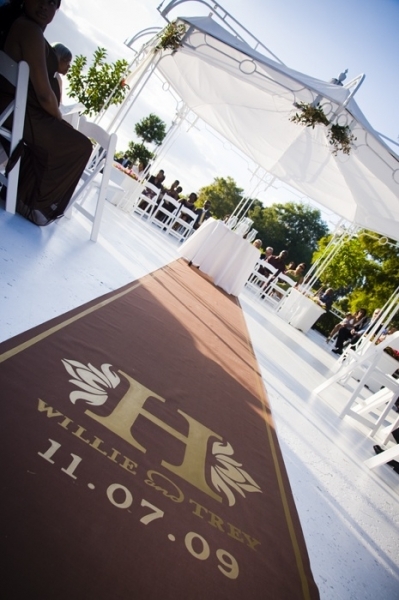 If you prefer a more traditional look, you can secure your fabric runner to wood flooring, creating a kind of runner boardwalk that allows bride, groom and wedding party to proceed (and recede) without incident. You won’t be able to do the traditional pre-processional rollout, but you will get the benefits of special-occasion grandeur and everyday safety in equal measure. 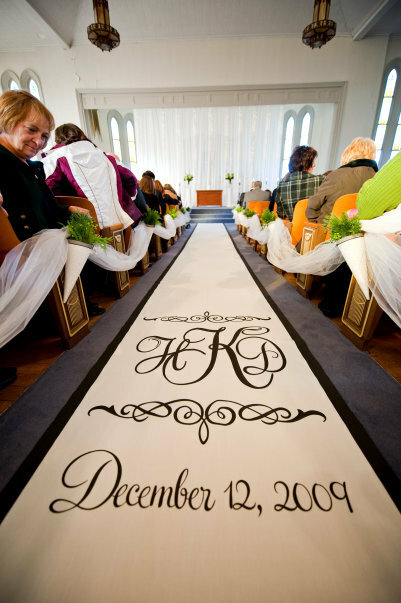 If you are investing in a custom runner—we especially love ones by The Original Runner Co., which makes non-slip fabric runners in a variety of extraordinary designs from romantic and classic to ultra-hip—you probably want to get the most for your money. It’s perfectly acceptable to have the runner fully rolled out prior to guest arrival, so that guests may enjoy its elegance from the moment they arrive. 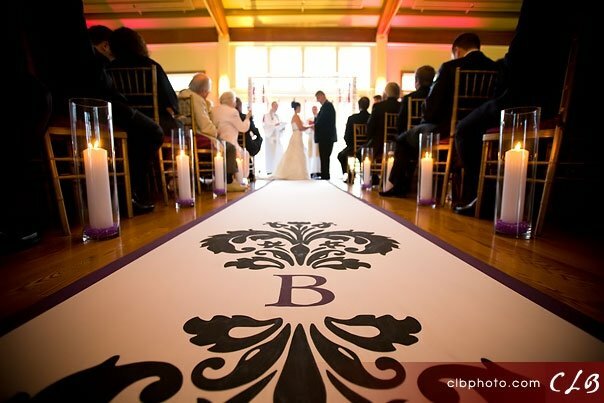 Just make sure the center aisle is roped off or otherwise blocked (with a floral arrangement or other removable pretty thing) so that arriving guests don’t use the aisle for locating their seats, and risk marring its pristine loveliness with footprints before the processional. 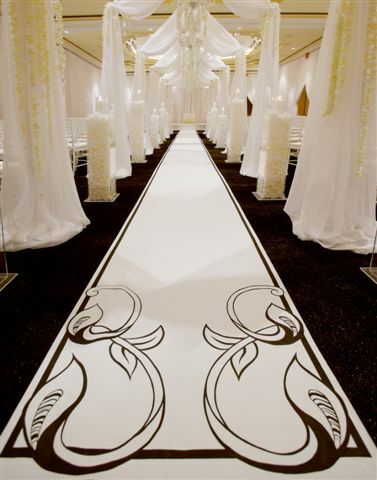 And remember, your aisle runner need not follow the straight and narrow—plenty of local florists and decorators can create winding, zig-zagging, swirling or otherwise non-linear aisle adornment. As for color, you’re not bound to tradition there, either. Yes, once upon a time, when evil spirits were thought to lurk beneath the earth’s surface, a white aisle was laid out to keep these baddies at bay and protect the bride’s purity. But this is 2010, and these days any color goes: tangerine, tourmaline, evergreen…pick your palette, and off you go, on your way to happily ever after.